Postoperative pain remains the most common challenge following inpatient and outpatient surgeries, and, therefore, opioid analgesics are widely used during the perioperative period. The aim of this study is to examine the efficiency of transversus abdominis plane (TAP) block using liposomal bupivacaine in reducing the use of opioid analgesics during the perioperative period of bariatric procedures. 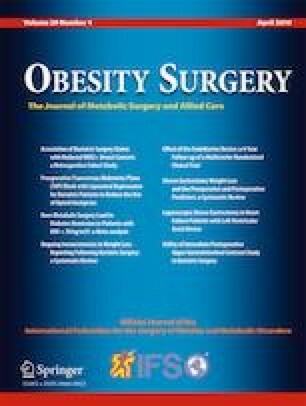 A retrospective chart review was performed on 191 patients who underwent a laparoscopic bariatric procedure between September 13, 2017, and February 26, 2018. A total of 97 patients received TAP block with liposomal bupivacaine, and 94 patients did not receive TAP block. Baseline patient characteristics were comparable between the two groups. The mean age was 43.7 and 41.1 years, and the mean preoperative body mass index (BMI) was 45.6 and 46.1 kg/m2 in TAP and non-TAP groups, respectively. In the TAP group, 65 patients (69.2%) received intravenous (IV) hydromorphone or morphine while 93 (95.9%) did in the non-TAP group (p < 0.0001). In the TAP group, 44 (46.8%) received oral opioid analgesic while 73 (75.3%) did in the non-TAP group (p < 0.0001). The odds of receiving IV hydromorphone or morphine for TAP group was about 0.10 times the corresponding odds for non-TAP group, and the odds of receiving oral opioid analgesic for the TAP group was about 0.29 times the corresponding odds for the non-TAP group. The use of preoperative TAP block with liposomal bupivacaine significantly decreased the use of IV and oral opioid analgesics. A larger prospective study may be needed to further validate the results. The authors would like to thank Dr. Kevin Funez, and other anesthesiologists in the Wolverine Anesthesia Consultants Inc. for performing ultrasound-guided TAP for our patients. Authors Moon, Lastrapes, Wier, Nakajima, Gaskins, Teixeira, and Jawad have no commercial associations that might be a conflict of interest in relation to this article.